Hey everyone, I'm pleased to announce my partnership with the Cloth team, creating exclusive DIY projects. 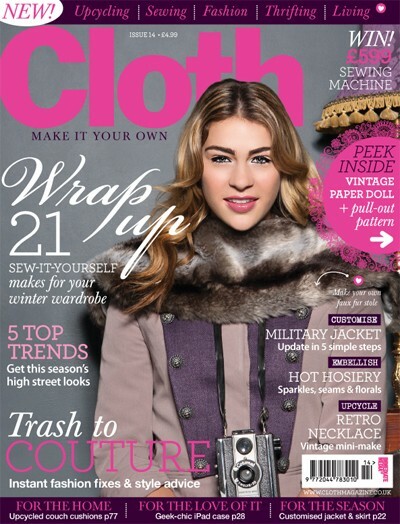 Cloth magazine is packed with on-trend and easy-to-follow projects to inspire. From beautiful clothes and homeware ideas, to customizing and upcycling advice-whether you're updating your wardrobe or creating a whole new look, make it your own with Cloth. Any DIY gal will love this magazine so I encourage you to check it out at your local Barnes and Noble (available Feb. 8th) or even easier, subscribe here. Congrats! That is very exciting. Looks like fun! I may have to subscribe to this magazine! I didn't know one like that existed...fabulous! Congrats on your collab! I'm sure it'll be amazing! Congrats also! I've loved seeing what you come up with next and your DIYs and altered clothing has always been some of the very best on the internet! That's fantastic! I have been following you forever and sharing your ideas and site. Good luck! I will be watching and hopefully reading the magazine. Is it digital?